Idaho Republican officials are continuing to press their case with the CMS to approve their unprecedented effort to let insurers sell health plans that do not comply with Affordable Care Act coverage rules. Lt. Gov. 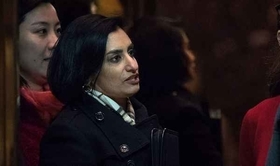 Brad Little, state Insurance Department Director Dean Cameron and U.S. Sen. Jim Risch (R-Idaho) met CMS Administrator Seema Verma Wednesday to persuade her to reconsider her March 8 letter rejecting their "state-based plan" model. They say they don't regard the letter as a final decision and hope to craft a revised version that can win CMS approval. Following Wednesday's meeting, Little said, "I believe we are back on track to getting an Idaho solution for Idahoans." Cameron said he and his Idaho colleagues "can't work" within the alternative approach being pushed by Verma to expand the use of non-ACA compliant short-term health plans. He added that the state would consider suing the CMS if the agency continues to block the state-based plan model. "Perhaps a lawsuit is an approach we have to consider," he said in an interview Tuesday. "It's not our hope. We want to work with the administration and we hope to convince them." Idaho officials argue that the cheaper, leaner state-based plans, which Idaho Blue Cross has agreed to sell, are needed to provide affordable coverage to about 110,000 Idahoans who don't qualify for ACA premium subsidies and have been priced out of the market. Experts say the Idaho case is a critical national showdown for the ACA's survival. Other Republican-led states are widely expected to follow Idaho's approach if the CMS permits it, which experts say could severely damage the ACA-regulated market and unravel the law's consumer protections. Verma's March 8 letter said the CMS has "reason to believe" the state would not be "substantially enforcing" current law by allowing the sale of proposed "state-based plans." She warned that if Blue Cross of Idaho goes ahead with its proposal to sell such plans, the CMS could impose fines of $100 per day per subscriber, followed by a cease-and-desist order. The Trump administration, with support from some congressional Republicans, is pushing to expand less-regulated short-term plans and association health plans as its preferred approach to offering coverage that's more affordable than ACA plans. Short-term plans screen people for pre-existing conditions, have no guarantee of renewability, and offer skimpier benefits than ACA-regulated plans. The administration has proposed to extend the duration of such plans from 90 days to 364 days and would like to make them renewable after that. Major insurance groups and congressional Democrats oppose making short-term plans renewable, arguing that this would drive up premiums for people in the ACA-regulated market, particularly for older people and those with pre-existing medical conditions. Cameron agrees with that view. Cameron said the administration's proposal, which Verma reportedly touted during Wednesday's meeting, gives him "heartburn" because it would damage the overall individual-insurance market by separating healthy and unhealthy people into separate risk pools. He criticized the lack of guaranteed renewability and protection for people who develop medical conditions, and benefits that are "worse" than in Idaho's proposed state-based plans. "The short-term plan approach offers lower-priced products but doesn't address the pre-existing condition turmoil that occurs every time (the consumer) moves between carriers," Cameron said. "It's not a solution for us. Short-term plans shouldn't be long-term plans. That's not the direction we want to go." Cameron even warned that the CMS' proposed rule expanding short-term plans would be vulnerable to a legal challenge. "I think someone will be able to show damages in court, that their premium for an ACA plan went higher as a result of short-term plans," he said. "It will be problematic." Under Idaho's proposed model, insurers would be able to sell plans with 50% higher premiums for people with pre-existing conditions; exclude coverage for pre-existing conditions for people who had a gap in coverage; vary premiums by 5-to-1 based on age; exclude coverage for some ACA essential benefits such as maternity care; and set a $1 million annual cap on benefits. All these features are prohibited by the ACA. But the state-based plans would be guaranteed renewable, if people could afford the risk-rated premiums. In her March 8 letter rejecting Idaho's model, Verma pointed to the proposed rule published Feb. 21 that would expand the availability of short-term plans by letting insurers sell plans lasting 364 days. "We believe that, with certain modifications, these state-based plans could be legally offered under (the Public Health Service Act) exception for short-term, limited-duration plans," she wrote. "I encourage you to continue to engage in a dialogue with my staff regarding this and other potential options." But experts say it would be legally dubious for the Trump administration to issue a rule allowing guaranteed renewability for short-term plans, and that congressional action likely would be needed for that. Some Senate Republicans, led by Wyoming's John Barrasso, are pushing to include a provision in the pending omnibus budget bill to define short-term plans as lasting up to 364 days and making such plans guaranteed renewable at the option of the applicant. That bill has to pass Congress by the end of next week to avoid a government shutdown. In opposition to that approach, Sen. Tammy Baldwin (D-Wis.) has introduced a bill that would establish a statutory 90-day limit on the duration of short term plans and require those plans to comply with ACA rules, including pre-existing condition protections and essential benefits. Cameron insisted his state has the law on its side. "We believe that under the law we can offer state-based plans," he said. "They may need to be modified. But in our opinion, if (the CMS) takes our overall body of work, which they'd have to do in a court of law, there's strong reason to show we are substantially enforcing the law."